Stacks was a project run by The Red Room Company which consisted of a series of poetry workshops in City of Sydney Libraries during August and the first weeks of September in 2011. Poets facilitating the workshops included Andy Quan, Eileen Chong, Judith Bishop and Toby Fitch. The facilitating poets were commissioned to create a new work that responded to the special collections of each library. 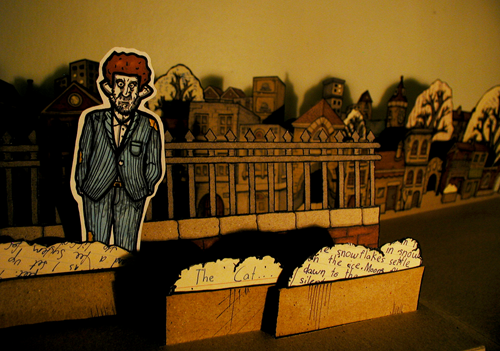 These poems, as well as the poems written by workshop participants, were then incorporated into an animated pop-up book by Sydney designer Tasman Munro. The book, The Analogue Crusader, and its animation, will tour a number of libraries in the coming months. Our Poems to Share cards were also installed across several City of Sydney Libraries for 40 Days of Poetry. The cards and writing exercises invited the public to pen new poems and share them with The Red Room Company. Poems written in response to the 40 Days of Poetry activities are collected online.